Some of you - the older ones - might remember guitar virtuoso Uli Jon Roth from his days with the Scorpions, after he got replaced by Mathias Jabs he kept making music, but was also active in other arts like painting and poetry. Now it's time to talk about his latest piece of work - Under A Dark Sky. This musical piece can roughly been described as a rock opera with classic elements...It also has a bit of a sound track for some motion picture... Anyway, Mr. Roth gathered some well-known and some not that known musicians for this opus. He hired Mark Boals and Liz Vandal (ex-Sahara) for the rock parts, but also got some trained singers for the classic / opera-influenced vocal parts. Beside his 6-octave Sky guitar it's also the arrangement which is classically influenced. With track no. 3 Land Of Dawn he presents the first rock tune, sung by Mark Boals and Liz Vandal - and this tune makes it easier for (prog) rock fans to get into Under A Dark Sky. Land Of Dawn is split into 3 parts and leads over to The Magic Word where the duet will enchant you as well as the 'singing guitar' of the sky guitar creator. All solo singers are also join the Sky Choir which is great, coz so you have trained classical singers and rock voices combined. Light & Shadows is another rock-based tune which features Liz Vandal - and for me one of the highlights, too. But surely the masterpiece on this disc is the last track Tanz in die Dämmerung which is split into 12 parts / themes. For rock and metal fans the songs with Mark Boals and Liz Vandal are probably more interesting then the orchestrated classic-influenced ones, but the album tells a story, so you should listen to the whole album and give it time to grow! Prog rock fans will easier find their way into Under A Dark Sky, even if this isn't a typical prog rock album. This is no musical fast-food, it needs time and attention! 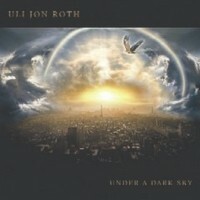 So ask yourself, are you ready for this Uli Jon Roth opus? Who wants to name the most famous guitarist, has to name a guy from Germany - Uli Jon Roth. He's known for his own band Electric Sun, as a guitarist of the Scorpions and also as an solo artist in the world of guitars. His arrangements of outstanding music and performance e.g. Jimi Hendrix interpretations with famous musicians from all around the world make him well-known and respected. The double CD shows Mr. Roth's tendency to create new innovative music. The 25 songs on the discs are partly recorded at his English castle and the rest was recorded at two live shows in Vienna and Paris. 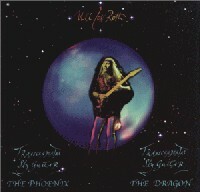 Uli Jon Roth compare this double CD with a coin. On side The Phoenix stands for the European style which is based on classical elements and influences from the rock music genre. CD #2 is The Dragon presents the American rock music which tries to combines the permissiveness of bluesy music and the classic music. Together with Don Airey on keyboards, Steven Bentley-Klein (violin and trumpet), Liz Vandall (vocals), Shane Gaalaas on drums and Mr. Barry Sparks on bass Uli Jon Roth performs Jimi Hendrix, Chopin, Mozart and Vivaldi in an inimitable way. He plays the sky-guitar which he invented with passion and the listener might wonder what the already passed composers would have said about this interpretations. He presents classical tunes in a different angle, shows new aspects and perspectives, even if you thought you know them already. Two hours of interesting music. I guess, there are still people who can't understand and tolerate this interpretations, coz they stick to what they know and don't want to discover new versions. Purists, Mr. Roth calls them, but music experts will love this double CD and I think that they can't wait to see him on stage.